Was shooting my Ruger Blackhawk in .45 ACP today at a public range, and on the 6th shot of my second cylinder-full, the gun locked up. I immediately realized I had a bullet stuck in the forcing cone, and stopped shooting. Problem was, being at a public range, I couldn't go in from the muzzle and punch it back in, so that gun was done for the day. I packed it up and took it home, and a few raps with a cleaning rod and a mallet and the bullet was punched back into the cylinder. When I removed the cylinder and extracted the case, all of the powder fell out as well, so the case was properly charged. I've shot hundreds of rounds with this load (230gr Summers Coated Round-Nose over 5.0gr HP-38 using a CCI Large Pistol primer) without any issue. I didn't think HP-38 was particularly difficult to ignite...I'm not really sure what happened. The primer definitely fired...it had enough force to push the bullet forward into the lands. But the powder never ignited. The only thing I can figure is there was something blocking the flash hole that got blown out when the primer ignited, but somehow prevented the flame from reaching the powder. I couldn't see anything blocking the flash hole when I inspected the case. 1. Inspect your hole (flash hole, that is)! 2. 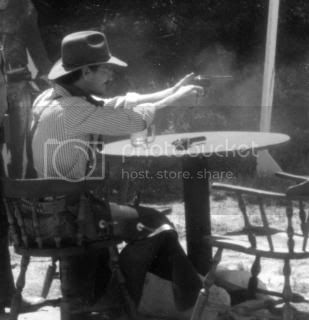 Revolvers do have their weaknesses...but it could also be considered a strength, as it made it mechanically impossible to fire a second round behind the first (thankfully the bullet didn't go in far enough to allow the cylinder to rotate). 3. This load is relatively light, and I already had 11 holes in the target at 15 yards, so I didn't notice the lack of impact or recoil. I think I would have definitely heard the difference if I'd been at my regular club where I'm usually shooting alone, but I'm visiting family this week and we went to a public range near their place. There was so much noise from other shooters on the line that I didn't notice there was an issue until I tried to unload the gun and the cylinder wouldn't turn. It could have been much worse. If so you may have had some moisture that got to the powder. With the explosiveness of the primer I doubt than anything blocked the flash hole to prevent powder ignition. It had enough force to move the bullet. Nope. All dry tumbled. And I ran every case through a sizer/deprimer as part of the loading process, too, so I find it kind of unlikely that anything was blocking the flash hole. But I can't think of any other explanation. There was definitely a full charge of powder in there (from a sealed container), but it didn't burn. I reload on a manual press and inspect every powder - drop. Then every once and a while I get that OMG did I just zone out and I inspect and have never had a double or empty casing. I'll be the first one to own my mistakes when I make them...and I'll agree that it's entirely possible that I missed something here, but for the life of me I can't figure out what. 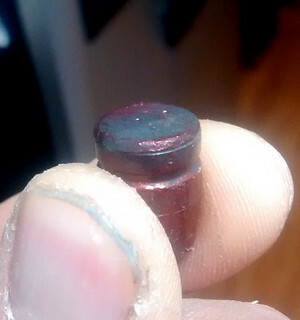 Like I said, the primer went off, and I found the full powder charge in the cylinder between the bullet and the case once I got the cylinder out and was able to extract the case. I didn't miss a powder charge...the powder just didn't ignite. I wish I knew what happened as I see troubleshooting stuff like this a valuable part of the learning process, which leads to improved quality control down the road. Maybe a piece of dry media stuck in the flash hole? That is if you deprime before cleaning. This is the only explanation I can figure, but it just seems so unlikely. I dry tumbled all my brass as the first step in my process. Then I deprimer/resize, expand, charge, seat, and crimp. I'd think that any media in the flash hole would have to be pushed out when depriming...but what other explanation is there? I'd say contaminated powder, but the other rounds came from the same batch and exhibited no issues. I have shot about 750 of this same load in the past few months with no problems whatsoever. Here's my hypothesis, worth every penny you paid for it. The powder in the case is very loose, 5grs just doesn't occupy all the space behind the bullet. The powder was flat, occupying the space below the flashhole when the case is horizontal. There may have been a piece of snot blocking the flash hole or the primer was somehow defective but when it fired, the flash was above the powder and did not set it off and it was just enough pressure to push the bullet out a little bit. I think a full primer explosion would have pushed the bullet out much further, and it would have ignited the powder. It's also very possible that you may not have even had the full 5 grains of powder, too bad you didn't collect and measure it. As good a hypothesis as any. The powder laying flat is an interesting idea, and I can definitely see how that could have contributed. 5gr only about 1/3 fills the case. I did think about measuring the powder, but I'm at my In-Law's in FL and have no way to weigh it, so I opted not to mess around with trying to take it home to IN. One more question. Did you notice if there was any sign of burns or combustion on the heel of the bullet? Yes, there are. Sorry for the creepy close-up of my fingers...but upon examination, you can clearly see the soot on the base of the bullet. It's definitely soot, too, not just powder residue. It's caked on there pretty hard. Excellent. This does mean the primer exploded, but since you got a good amount of unburned powder out of the case, it would appear the primer did not ignite the powder but went straight to the bullet and pushed it out a bit. This reinforces my hypothesis that the powder was simply not between the flash hole and the bullet. And I still think the primer was somehow compromised in part. I think you simply had a bad primer. Sounds like something called a "meltdown". Happens sometimes with mil-surp rifles, but I think it could happen with a revolver round, too. As I understand it, the meltdown happens because the pressure does not build up enough in the case when the primer fires. To ignite all of the powder, you need the primer to send the molten slag into the case, i.e., you need the "spark" from the primer firing, but you also need pressure to build up rapidly in the case or the powder will not complete ignition and burn. In mil-surp rifles, it can happen if the cartridge case has been resized too much and thus leaves too much room around the case when it is chambered, or if the neck tension on the bullet is too light, or if it is particularly cold, or if a powder is used that ignites better with a magnum primer but a standard primer was used, and certain powders are more prone to meltdowns than others. The thing with a meltdown is that most of the ammo, almost all of it, will fire. It is just the rare round that goes through this. I don't know from first hand experience if a meltdown can happen with revolver cartridges, but I don't see why not. You're sure that the case was loaded with powder, you are sure that the primer fired, and you tumble before decapping. So, all the theories advanced so far are not plausible. Florida is not cold weather, but leaving that cause of meltdowns aside, you could have had one or more of the other causes. Interesting...I'll have to do some research on that. Would not a good primer fill the case with fire therefore igniting the powder? If it were me I would load a round using the same type bullet with no powder and see if I get the same results. If the primer fired, the powder would ignite. HP38 is quite fast, it would go instantly. An odd event, but if powder came out, it tells me something was contaminated. I had that happen in .38 Special; a 125 gr bullet loaded to the same OAL as 158, therefore more empty volume. Gun brought up from low ready, therefore powder at the bullet far from primer. No ignition, bullet stuck in barrel with unburnt powder behind it. But it seems less likely with a stubby .45 and more powder than I had in that .38. P.S. I reseated those 125 gr bullets as deep as possible and they shot normally.